"I am a militant Christian; to prevent the de-Christianisation of Europe is very important." How do those of us who are Christians reconcile his radicalised statement with our own interpretation of the faith? After all, I dare say there are a few secularists out there who are rubbing their hands and nodding "knowingly" under a false assumption that this confirms what they have maintained all along. As far as I am concerned, the simple truth is that people like Breivik have no idea what a militant Christian actually is... and it is motives and actions such as his that threaten to de-Christianise Europe. For that matter... isn't "militant Christian" actually an oxymoron? "The acts of the flesh are obvious: sexual immorality, impurity and debauchery; idolatry and witchcraft; hatred, discord, jealousy, fits of rage, selfish ambition, dissensions, factions and envy; drunkenness, orgies, and the like. I warn you, as I did before, that those who live like this will not inherit the kingdom of God." A good half of the acts listed above could be directly attributed to the behaviour exhibited by Breivik last year. In fact Jesus himself said that the behaviour we all manifest comes from our nature deep within. Good acts and thoughts come from those who have the goodness of God within them, whereas those who brood over hatred, fear and darkness exhibit actions that reflect those evils. When Jesus’ followers saw what was going to happen, they said, ‘Lord, should we strike with our swords?’ And one of them struck the servant of the high priest, cutting off his right ear. But Jesus answered, ‘No more of this!’ And he touched the man’s ear and healed him. Then Jesus said to the chief priests, the officers of the temple guard, and the elders, who had come for him, ‘Am I leading a rebellion, that you have come with swords and clubs? When things were at their darkest it was not in Jesus' mind to harm his oppressors or maim and kill those who thought differently... but rather to heal and reconcile instead. Jesus calls us to abandon violent lives, full of hate & fear. It occurs to me that when the spiritual chips appear to be down, the deepest truths about who and what we are tend to be revealed to the world at large. Those who are rooted in fear will attempt to wrestle control back from the universe and assert their own designs on how it should operate. Those who are rooted in love do their utmost to hold the course despite their deep anguish. It is easy to be seduced by the paranoid rhetoric that surrounds those who oppose multiculturalism... maybe not to the same extent that it appears to have warped Anders Behring Breivik, but there are dangers for us all nonetheless. In the midst of this, we must not forget that the Early Church shared none of these fears. Christ and the early Christians lived in a multicultural society. They lived under the secular rule of an Empire that had pantheons full of foreign gods. Even in Judea the presence of Roman culture was keenly felt even while Judaism was still tolerated. If the progenitor of our faith and his earliest followers, were able to be assertive about their own beliefs in the midst of all the competing cultures that were geographically encroaching on them, then why would we be any different? If we accept God's kingdom is not of this world then why are we so obsessed with exerting cultural control through secular power? Is this the battle we should be fighting? Which brings me to my main and final point.... what *I* believe a militant Christian is. I believe that militant Christians are those that hold most fiercely to the Kingdom values - Those who are aggressive in their determination to be a compassionate follower of Christ - people who love unreservedly, who forgive utterly and who trust unswervingly. We do have an enemy... one we should fight relentlessly and aggressively without surrendering, conceding or capitulating, but our enemy is not quite who or what you might think. "For we are not wrestling with flesh and blood [contending only with physical opponents], but against the despotisms, against the powers, against [the master spirits who are] the world rulers of this present darkness, against the spirit forces of wickedness in the heavenly (supernatural) sphere." Normally I use the NIV translation but I wanted to make certain there was no room for ambiguity about who the Bible identifies as the opposition. Is our enemy found in the faces of people who hold different beliefs and values? Every day, here and at home, we are warned about the enemy. But who is the enemy? Is it the alien? Well, we are all alien to one another. Is it the one who believes differently than we do? No, oh no, my friends. The enemy is fear. The enemy is ignorance. The enemy is the one who tells you that you must hate that which is different. Because, in the end, that hate will turn on you. And that same hate will destroy you. Our enemy is fear, hatred and the spiritual forces that cultivate these destructive forces. We don't need to hate people and we mustn't hate them, no matter how different or alien they appear to be. As much as the Bible tells us who our enemy is, it goes to even greater lengths to remind us of who our neighbour is... and who we should love, even if they don't deserve it. So if there is a militant Christianity... where do we find it? 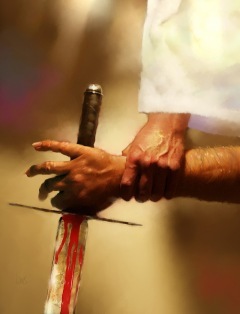 Militant Christianity is not found on the blood stained sword; it is found on the tear stained cheek.